I love to garden with kids. I personally love the relationships that develop when I work side by side outdoors with kids that are tough to connect with. I love watching plants grow under the care of children, and I love that they can develop patience for both immediate and long term results. I garden with children frequently. At home, my kids will help out by digging in the beds with me, transplanting established plants or setting in seeds. We garden vertically, in raised beds and right in the ground. I also am lucky to be able to garden at work. I teach in our school garden all day, every day. I currently facilitate over 20,000 garden visits a year in my role as our school’s garden teacher. All this is to say our team is highly qualified and experienced to lead you and your students through a year of growing in your very own school garden! Contact us to find out how we can support your school’s garden goals, or read on for some tips to go at it on your own! Veggie starts are reasonably inexpensive, grow faster for impatient little people and are less tender and fragile than seeds started indoors that need to then be transplanted by sometimes clumsy hands. That doesn’t mean you shouldn’t plant seeds! There is a lot of learning that comes from planting from seed, but if you yourself are not confident in how to plant and maintain seed life, then go for the organic veggie starts to give everyone the best chance for success! As a participant in The Classroom Gardener’s programming, your students will have the opportunity to start seeds indoors, transplant them out into the garden and sow seeds directly into the gardens. Let’s be honest here. Kids often put their hands in their mouths, noses and everywhere else without properly washing them first. I insist on gardening gloves for kids, particularly in gardens with public access. The risk of insect bites, contact with animal feces and infection from dirty wounds can all be reduced with the proper use of garden gloves. In my experience, nothing is more frustrating for kids than having to work in a pair of adult sized gloves, so get a pair that fit those little fingers. Here are kid gloves I recommend. As a participant in The Classroom Gardener’s programming, your school will receive gardening gloves for both students and teachers. 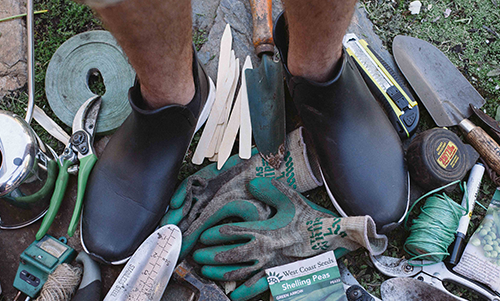 Luckily for us, gardening on the west coast is a three, or even four, season activity. Heath Canada recommends children get at least one hour of vigorous exercise each day- gardening makes that easy! Children as young as 8 can master the wheelbarrow; it’s a great way to work on balance, coordination and build strength. Smaller children enjoy using shovels and pulling weeds, as well as watering the beds. All great ways to get fresh air, build strength and get those wiggles out! As a participant in The Classroom Gardener’s programming, your school will receive all the required tools, fertilizers and garden supplies required to run a successful school garden! Over the years I have had enormous success with kids eating traditionally “non kid” foods by growing them and harvesting them with the children. Kale? Delicious! Brussell sprouts? More, please! Children have a natural and enthusiastic taste for healthy foods. They won’t shy away from them when they can rinse them under the hose and eat them on the spot! As a participant in The Classroom Gardener’s programming, your students will learn sustainable harvesting methods and participate in the harvesting and eating of crops grown in your school garden. A garden is the ultimate classroom and third teacher. Talk about the area of the plot, estimate how many plants can fit in the bed, use arithmetic to solve how much soil will be required to fill a bed. There is an endless amount of “school” learning that can happen in a garden including Science and Social Studies. Learning about Pioneers? Let’s experience an hour of what life was life in those days and why a crop was so important. Imagine and tell oral stories about what life would be like if this was your only reliable source of food while you work. As a participant in The Classroom Gardener’s programming, each teacher will receive a comprehensive teacher’s guide with cross-curricular lesson plans, inquiry questions and journalling activities that meet the big ideas, core & curricular competencies of the new BC curriculum! Themes are a fun way to engage reluctant gardeners. I’ve helped kids create butterfly gardens, fairy gardens, “pizza” gardens and even a star wars garden. Discussion around which plants are suitable, what the imagined garden will look like and whether it will be edible are all meaningful opportunities to problem solve and develop teamwork skills. As a participant in The Classroom Gardener’s programming, your school will receive loose parts to get your fairy garden started as well as teacher pro-d on the logistics and importance of play in the school garden. It’s hard to remember how plain and uninspiring a patch of dirt was before you began. Taking pictures along the way helps children reflect on the learning process, is team building, and supports visual learners. Looking back on photos tells the story of the learning that has occurred and is a useful tool for narrative, procedural and descriptive writing activities. As a participant in The Classroom Gardener’s programming, your staff will receive two pro-d sessions covering the multitude of ways the curriculum can be taught outdoors.